I am a refractor man. My first refractor was Zeiss Telementor 63/840. I observed through it in my childhood. In my adult life I recognized that I could also achieve my observing dreams of having the premium refractor. 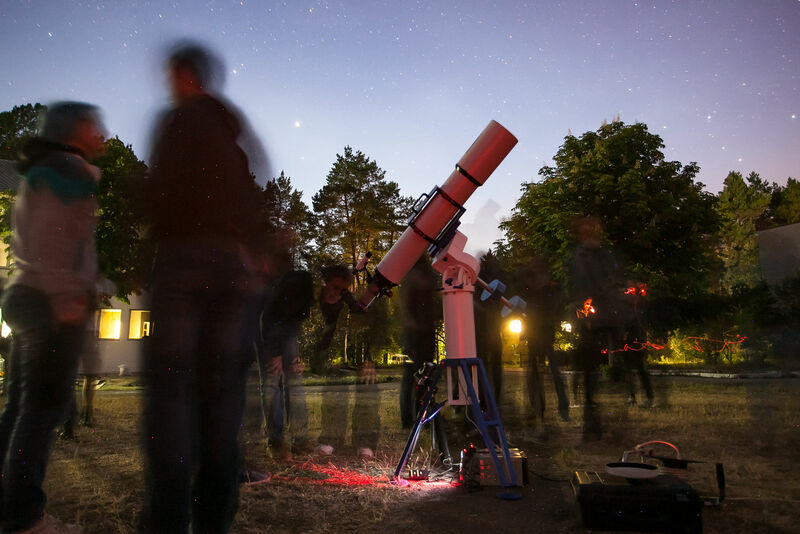 Being members of the Kyiv Astronomy Amateurs Club (Astropolis), I spent a lot of time at the club forum. At the end of 2016, I saw the announcement: Edward Trygubov about the release of his new series of refractors. Oh, my God, I thought, it's the same Trygubov! I heard about him as a professional optician who left Ukraine to start optical production in US. and making premium custom optics for amateurs! Something snapped inside me, and I thought it was my chance that I could finally become the owner of a first-class refractor. I contacted him and Edward told me about the new doublet fluorite refractors. I was so fired up that I chose 150mm, not 130mm as I wanted at first. So, the order was completed. I was looking forward to see my telescope. I realized that this will not happen as quickly as I wanted. I was very worried and did not want to send the telescope by mail. Then Edward suggested, "Why do not you come to us to pick it up? We will soon have a total eclipse of the Sun, we could watch it together." I was so happy... to get to the USA to see the first total solar eclipse in my life, and to bring home my own refractor! Edward and his wife warmly greeted us - me and my friend, a journalist of our local astronomical magazine. starting with the calculations of the optical system, continuing the refinements of glass processing, and ending with the manufacture of mechanics. and was simply amazed by its quality and level of correction, double pass of 400x without any issues! Then, we went on a trip to Colorado and Wyoming, where we successfully observed the eclipse of the Sun with the help of Agema SD 130. It must have been the brightest summer of my life. When I returned to Kiev, I could not immediately begin to observe. You know, 6" refractor is not the scope that you can grab and go for an hour under the sky - this is a serious instrument, and I treat it adequately. that was designed by engineers of West Ukraine in Ternopol. My mount was ready by the time for our annual meeting of the Astropolis Club in May, where I came with Agema SD 150. I was excited about the "first light" of my telescope. Even some cloudiness did not prevent it from stargazing (from the east, the haze loomed unhurriedly). First of all, I pointed at Arcturus, and saw a crystal clear image, the star was orange and only, no extraneous colors or halos. As there were about two dozen people around me wishing to observe, and we were in a hurry while there was still clear sky - I could not make a full star test. However I will do it both visually and photographically to share. Then I pointed at M13, and for a long time could not keep myself away from the eyepiece ... I liked the image so much. With magnification of 133x given by ES 9mm 100° eyepiece, the cluster scattered into hundreds of stars, and thousands of stars glowed against its background. At some point, it seemed to me that I saw a "propeller", known to many as three darkish stripes against the backdrop of a star ball. The haze gradually wrapped the whole sky, the faint stars began to vanish, but few remained to wait for Jupiter to rise above the trees. I could not resist and guided the telescope to the planet, while it hid behind the tops of the pines. When Jupiter looked out from behind the forest, a spectacle awaited us. I put the Vixen LVW 3.5mm eyepiece, it gave about 340x magnification - more than 50x per inch! Jupiter looked large, a well-defined disk, I quickly noticed the effect of atmospheric dispersion - the upper edge of the planet was framed by a thin red border, and the bottom edge - blue. Despite the haze, the image calmed down, and then the gaze opened to many tiny details in the equatorial belts, thin light zones in the tropical belts. The contrast of the image was very good. What a pity that at the time there was no big red spot on the disk. Galilean satellites, all 4, were visible - and I'm sure I saw their disks. I expected to see a diffraction pattern around them - but it was not visible. For myself, I explained this by very small residual aberrations that I couldn’t distinguish at the optical bench at Edwards’ shop, thanks to which the maximum of light is concentrated in the Airy disk. The people who watched Jupiter with me did not hide their emotions. "Wow", "That's it", "Wonderful" ... a few people said that they had never seen such details on Jupiter. And there was a line of people to observe, so I didn’t have much time for myself… I really need my time alone with my scope! I also tried a less powerful eyepiece, ES 5.5mm - using it, the scale of the image was smaller, the clarity was not higher but it was still sophisticated. An hour later, the haze completely clouded the sky and observations had to be stopped. but the main thing is that the first light was given to an excellent telescope, which hardly has analogues in our country. No surprise, optics is excellent under the stars as well as it was on auto-collimation. But I could not omit superior quality of mechanics. as fluorite have different thermal expansion comparing to glass and so lens should be in comfort during the summer as well as during the winter. Focuser is rock solid when it holds heavy diagonal and large 100° eyepiece, focusing is silk smooth similar to Feathertouch, focus is reached easily with 3.5mm eyepiece. It’s easy to change eyepieces with rotating lock ring. The large handwheel elegantly unlocks focuser rotation which is so precise that object still centered while you rotate, even with 340x. Of course, there is durable cradle with carrying handle. It is like black and white, like earth and sky… ES will be sold soon. Ahead of me are still waiting for difficulties - start building an observatory away from Kiev. But I learned to wait. Most importantly – I already own the telescope of my dreams … I regret I didn’t order SD 180. Edited by Aleksandr Naumov, 31 May 2018 - 05:58 AM. I´m very interested in these scopes too and some first hand infos are very welcome! Some shots of the scope and especially the optics would be too great! Looks like you´re very happy with it and the optical performance delivers what it should - could you tell us how much the weight of it is (complete with rings, rail and handle)? Was you ever able to test a TEC scope? if yes - are there any noticeable differences? on first photos theses scopes look very, very similar. Until now I read only about one Agema scope - it was a 150 too that was sent to the german partner for presenting it a exhibition - but unfortunately it seems the focuser was damaged by transport and so the scope was sent back. Thanks for sharing. How much time does it need to cool down and what's the temperature difference? Currently, I have several photos here, sorry for poor quality. Nearest times I plan to make high-quality photos and place it just here. I did not placed entire tube on a scale, so I'm unable to specify total weight right now. I feel its total weight is about 14-16kg or so. I will update this information soon. I'm not sure but think there is no TECs in our country. No chance to compare. In my hard opinion, such a refractor is not the thing which could be shipped safely and securely. Especially when there is fluorite lens. This is why I preferred to flight to the USA instead of shipping. I transported tube as baggage; I carried lens cell in Pelical case in my own hands for all three flights to home. How much time does it need to cool down and what's the temperature difference? At the moment, I have not enough data to tell for sure. On first light event, scope was left for some half hour until we prepared the mount, then we started to observe immediately, and scope already gave excellent images. Personally for me, cool down time will not be an issue since I plan to install Agema permanently. Edited by salico, 31 May 2018 - 09:22 AM. let's hope that there are more reports to come. Although it's hard to implement without permanent observatory - the instrument is not intended to be easily transported, overall weight is about 70kg - I promise to publish observing reports here. Dear all, thank you for your attention! OMG 70 kilos....it truly is the case that a C14 is a small portable scope! But are you sure? The spec page says only 12.8 kg (28 pounds). I guess you mean including tripod and mount....yes, that would be a fairly normal combination of mount, pier, OTA. Don't forget 25 kilos for the battery to run all the gear. Actually it would be very useful for everyone if you were to take the time to carefully evaluate the differences between the ES127 triplet, which is currently on sale for $1,350 and the 150 mm Agema which is listed at $9200. It is true that there is an aperture difference. But people will want to know what the extra $8,000 gets them. So if you can put it into words, that would be helpful. The Agema SD120 is only $4,300 so many people might be willing to spend the extra $3,000 over a mainland China import if they had a clearer sense as to where the quality improvements lie. You're right, 70 kg is overall weight. Two counterweights on shaft are 25kg, mount head is about 20kg, pier is about 15kg. if only I started to compare Agema vs ES, then it could be similar to anti-advertising? Immediately after I received ES two years ago, I was thinking hard and decided to not write any report here. What if I described all these issues like broken collimating screw hanging inside tube, lens coating full of indelible dots, impossibility to reach focus when viewing directly (without diagonal), cracked plastic inside diagonal, "traffic light" instead of star etc. etc.? Maybe I was wrong and it was worth to describe? Finally, let every decide to himself what to choose and how much to pay for it. Everyone has different priorities and circumstances. Personally me, I always intend to achieve the best, this is why I chose Agema and I'm happy with it. Sure I compared ES and Agema, although observed with each of them different times this year. With ES (focal distance 952mm) and Vixen LVW 3.5mm, I never saw Jupiter sharp. With Agema (focal distance 1200mm) and the same eyepiece, I saw Jupiter once as very sharp and so contrasty and full of details I've never saw before. Actually it is worth describing because then people can think about whether they want to take a chance on having similar problems or whether they want to spend more money and we hope NOT have those problems. The thing of it is, when you are looking at pictures on the internet and looking at these inexpensive scopes people tend to assume they are beautiful wonderful instruments. McDonalds does the same thing with its hamburgers. The pictures always look better than what you get in the box. But you're only spending $3.00. An excellent view of Jupiter with a 3.5 mm is precisely what people want. Anti-advertising, as you call it, is also called a bad or negative review. A bad review does two good things. First, it provides an incentive for manufacturers to improve their low-cost products. Second, it provides potential buyers of Agema (or other top quality) telescopes a reason to save their money and consider the more expensive option. In other words awareness of what the high prices buy is a means to send more business to Agema--and of course, other scopes that are similarly priced. Actually I've had experiences similar to what you describe, but with a mount, not an optic. I did write a review but it was about 15 years ago. Well, you described the initial state of your ES as "broken collimating screw hanging inside tube, lens coating full of indelible dots, ... 'traffic light' instead of star". Did you get these issues fixed before trying to view Jupiter @272x? He's in Ukraine, a return for repair might not be easy. Cardinal Ximénez - NO ONE EXPECTS THE SPANISH INQUISITION! As I'm not optician, all I could do is to screw in broken screw and re-collimate lens cell. At all, let me not describe anything about my ES adventures - this thread is solely about Agema and my observations with it. If you'd like to read about my ES experience, then let me open another thread. Edited by Aleksandr Naumov, 01 June 2018 - 12:51 PM. Thanks for your report, keep them coming as you observe with it more and gain other impressions. Sounds like a winner! I would expect optics and mechanics to be exceptional, Ed is a perfectionist. Congratulations on your new scope, enjoy! Edited by Richard Whalen, 01 June 2018 - 01:25 PM. Awesome. An Agema 120 is on my dream list. Seriously, I much prefer a doublet over a telescope with 3 or more lenses. There is less to go wrong, and being less front-heavy, the optical tubes are easier to mount. Cool-down times can be shorter, too. And oil seepage from a triplet? Ugh! I have been in contact with Agema regarding a 130 and I might go that route rather than a TEC 140. I would really like to see some Astro photos to get me there. In reality it is a toss up probably but if I can stay away from oil I would rather go that route if everything else is equal. They say it is good for both visual and AP which is something I am looking for. But each scope is better at one than the other and that is really what I would like to know. Not a bad price on the 127. I don't want another top heavy triplet. Wished it was a doublet ED. LESLIE PELTIER=Gold Standard observer.... do you have any info to share? Installing a filter on a SW Espirit 100mm refractor?